We’ve got our hands on DJI’s new drone, the new DJI Mavic Air. Before we dive in for proper impressions, comparisons and a review, let’s simply take the thing out of the box to see what it comes with. 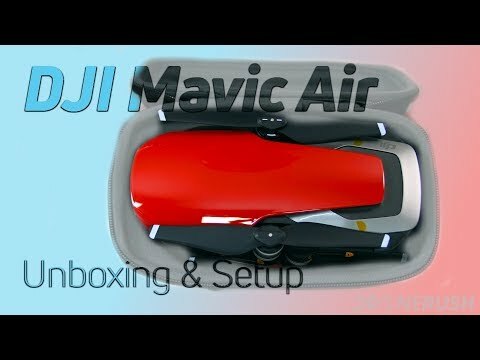 We ordered the DJI Mavic Air Fly More combo in Flame Red. Let’s unbox it and prep for our first flight. 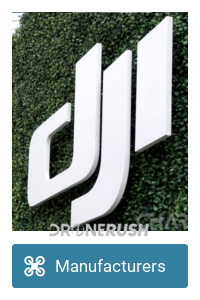 DJI announced the Mavic Air on January 23rd, 2018, with first shipments on January 28th. 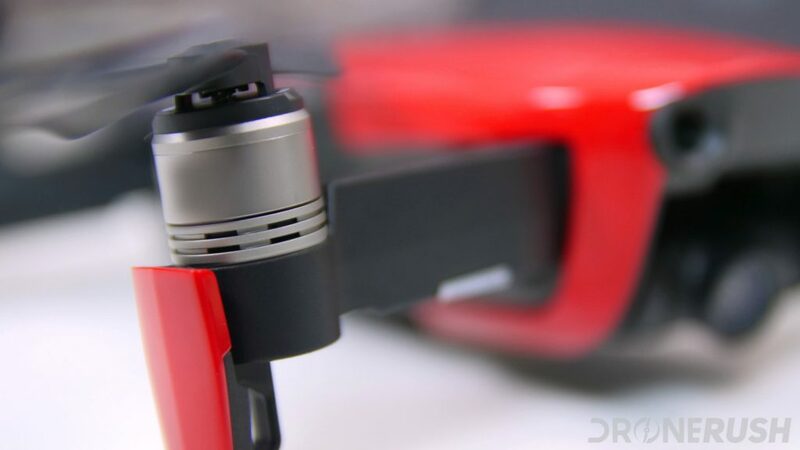 If we had to explain the new drone in one sentence, we’d call it the natural progression, iterative update should you have combined the best of the DJI Mavic Pro and the DJI Spark. 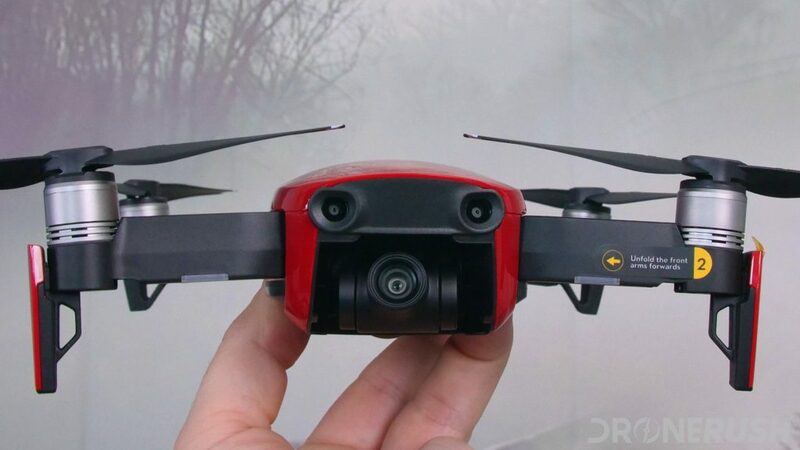 Indeed, the DJI Mavic Air shares some hardware, software and many of the same features as the two previous compact drones. 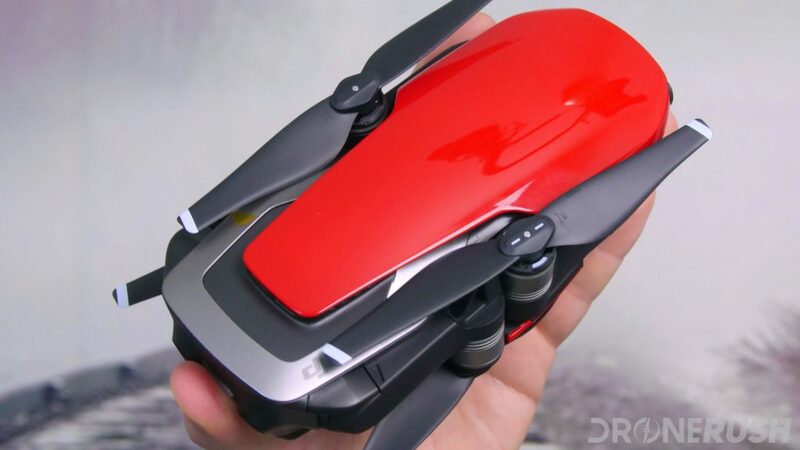 Most notably, it has the hand gesture controls from the Spark and the folding portability of the Mavic Pro. The same camera sensor is on deck, but with an update that makes it better, and rear facing obstacle avoidance sensors increases flight safety. We’re going to keep this short here today, after all, we’ve covered some of the specs already and will cover them all in our upcoming review. Stay tuned for that. The basic spec list includes that 1/2.3-inch camera sensor that shoots at up to 100 Mbps. It’s a 12MP sensor with 4K video at 30 FPS. Two front, two downward and two rear sensors provide obstacle avoidance. More than that, the new ASAP flight intelligence means your drone will navigate around obstacles instead of just halting before collision. Can’t wait to put that to work. Top speed is 42.5 mph, service ceiling is 16,404 feet and you should enjoy stable video in winds just over 20 mph. 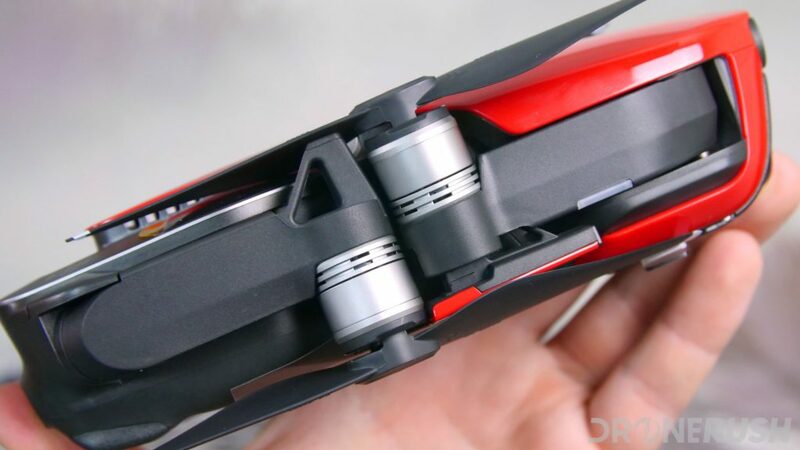 The most important specification, when folded down, the DJI Mavic Air measures just under 2 inches tall, 3.5 inches across and 7 inches long. 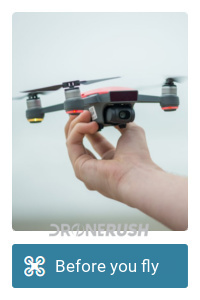 Those aren’t exact measures, but nor is telling you that the drone just fits in the back pocket of my jeans. 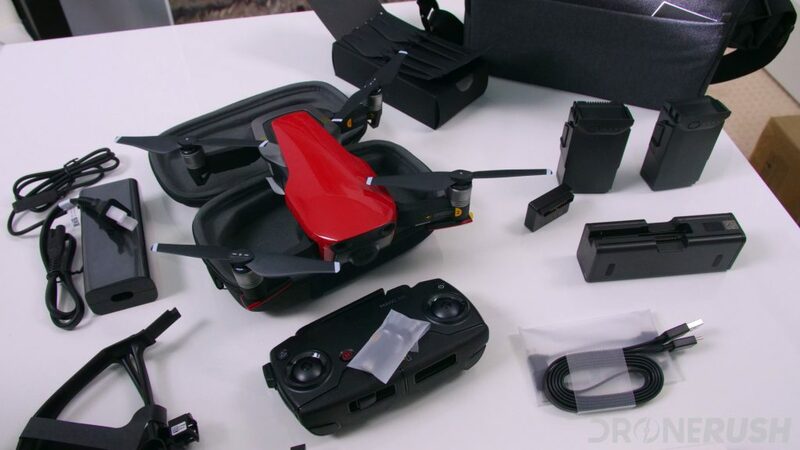 With the Fly More combo, you get a few extras compared to buying just the DJI Mavic Air by itself. 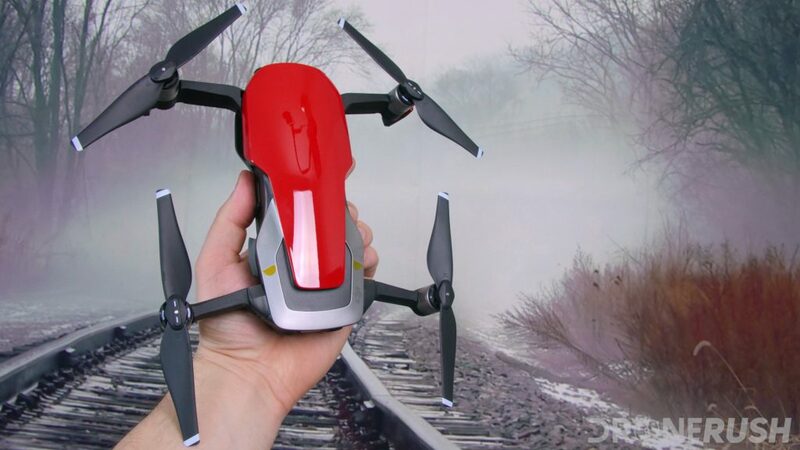 At least everyone is going to take home the drone itself, the remote control, a battery and charger. 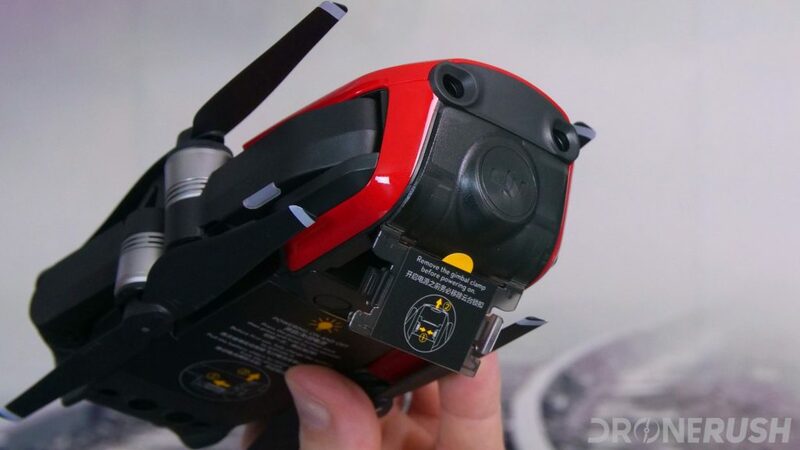 Additions in the Fly More combo include two extra batteries, a charging hub that can handle up to four batteries and an adapter that enables you to charge your phone using one of the drone batteries. Like previous DJI charging hubs, the Mavic Air hub charges one battery at a time, starting with the one that is closest to full. The base power adapter that can charge a battery directly is used to power the dock. This brick includes two USB ports as well, one of which you’ll need to charge the remote control. Two sets of replacement propellers are well boxed up. A replacement set of joysticks for your remote are also included. The kit comes with a USB to USB Type-C cable. You’ll need this cable to directly connect to the drone, or use the micro USB adapter to connect to the remote. Speaking of connecting to the remote, you get one of each, Lighting, Micro USB and USB Type-C cables, to connect your mobile device to the remote. I’ll gloss over the fact that you get a schwack of documentation to tell you that there are propeller guards as well. Finally, the base drone kit delivers the Mavic Air inside of a small supportive shell, but the Fly More combo includes a full travel case. The shell holds the drone alone, but the case will hold additional batteries and the remote control. Set up is very easy. 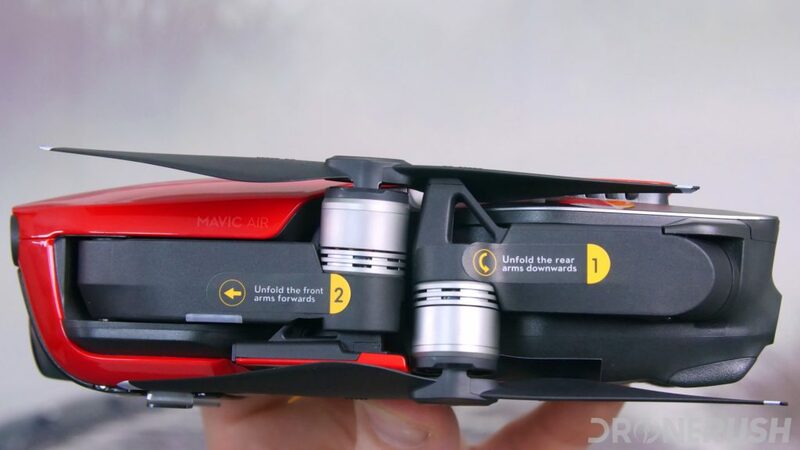 Your new DJI Mavic Air comes with some stickers installed that you’ll need to remove. However, learning how to work the machine and charging the batteries are the hardest part of prepping the drone. The remote control requires some attention. Our Mavic Air came with the Lighting cable pre-installed. It takes but a minute to pull that off, swap the RC cable slider and install the USB Type-C cable to connect to our Android phones. Then, of course, screw on those joysticks. Once you have the batteries charged, go ahead and turn everything on to make sure it connects. 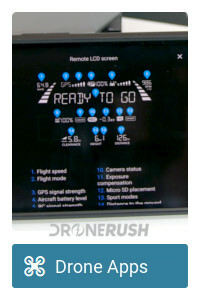 This includes connecting your mobile device through the DJI GO 4 app. We’ll put out a short article on how to manage that shortly. 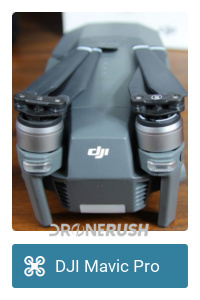 Before you fly check for firmware updates. Don’t shrug them off. I mean, it may be just fine to ignore them, it’s possible nothing will go wrong, but if you ignore the update and something goes wrong, is it fair to expect warranty repair if you did not follow the factory setup instructions? The risk is yours, we’ll be updating ours before we fly. 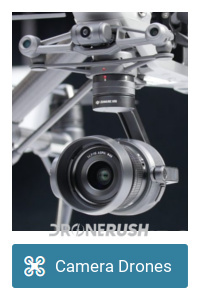 Finally, learn how to work that gimbal cover. It’s a simple thing, you’ll get it. 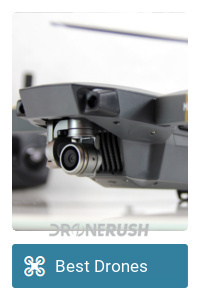 I still have a cracked gimbal cover on my Mavic Pro because I didn’t take the time to learn how it works properly. 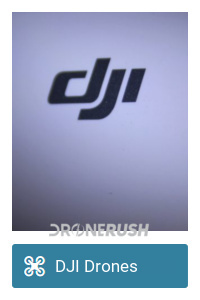 I actually broke it on film, as I was unboxing the drone on video for you and just yanked it off. 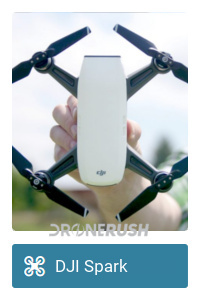 That was back when we wrote about drones on Charged.io. Good times. Should you buy the Fly More combo? This is a tough question. 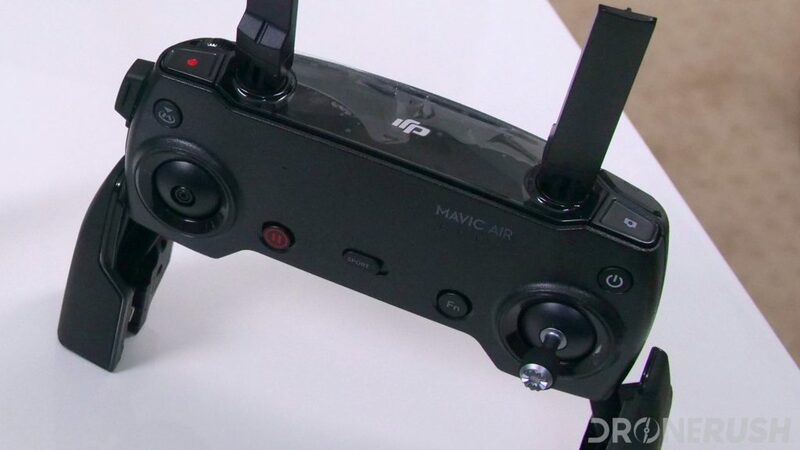 There is little doubt that the added batteries and charging hub make the DJI Mavic Air Fly more combo very appealing. Having three batteries allows you to get close to an hour and a half in the air when you are away from the charger. That’s a good day of flying where I come from. The charging hub is convenient, but certainly not a necessity. This goes for the travel bag as well. It looks good and is set up very well, but you can use near any bag. Heck, I joked the other day that a heavy duty hiking sock could make a good Mavic Air bag. DJI Mavic Air is $799. This comes with the remote control, one battery and the base set of charger and cables. It does include the propeller guards as well. A spare battery is $79 and the charging hub is $49. 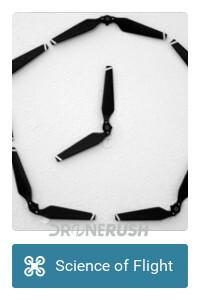 The Fly More combo also has one extra pair of propellers for $9. 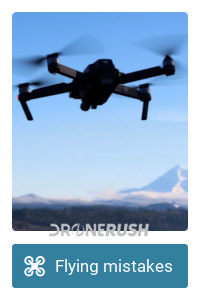 That means that, without considering the travel bag for $69, you’d be looking at $1015 to ‘upgrade’ the base drone package for the same flight time. DJI Mavic Air Fly More combo is $999. We think it’s worth the value, it’s what we purchased for ourselves, but we tend to travel far and fly lots. If 20-30 minutes of flight time is enough for you in between charges, grab the base kit. We have plenty to come with the new DJI Mavic Air. 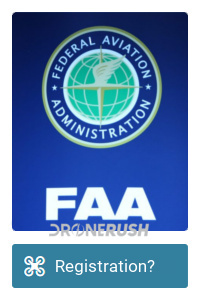 Make no mistake, we’ve written this post and we haven’t even flown the drone yet. Next up we’ll share our first impressions with the drone in hand, then we’ll get to work on learning the machine inside and out – we’ll have a full review for you as soon as we can. 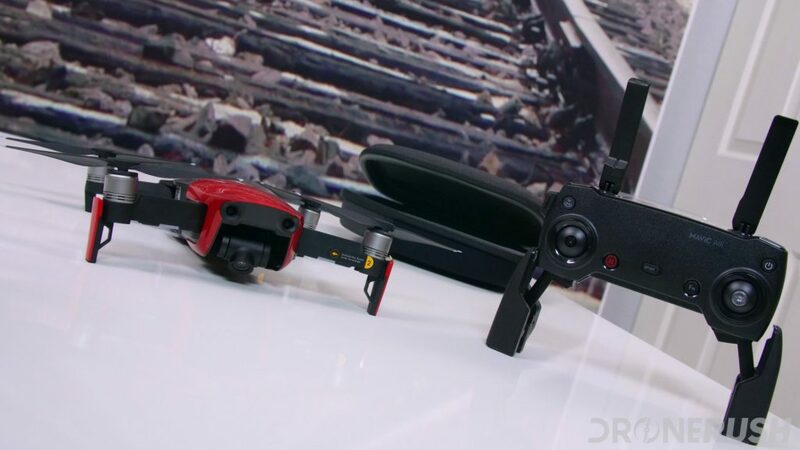 Are you opting for the base DJI Mavic Air, or will you grab the Mavic Air Fly More combo?